Laura Shaeffer works as an inter-disciplinary artist-organizer and cultural producer based in Chicago, Illinois. From 2007 to 2009, Laura and her husband Andrew Nord hosted a series of contemporary art exhibits in their home in a project fittingly called Home Gallery. 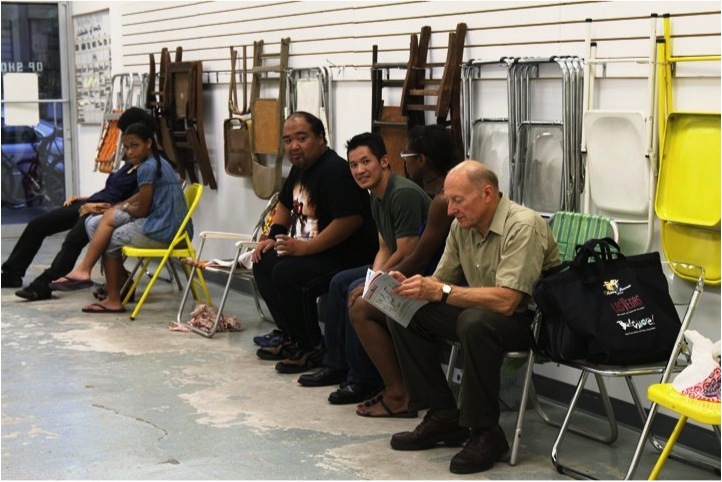 In 2009 she started The Opportunity Shop (Op Shop), a collaborative artist project utilizing otherwise empty urban spaces on a temporary basis to create sites of community involvement and artistic exchange. Laura is interested in creative community development, informal education and experimental sites of cultural exchange and activity. She is currently serving as artistic director of SHoP: Southside Hub of Production and as co-producer of exhibitions and events for HPK: Hyde Park Kunstverein. 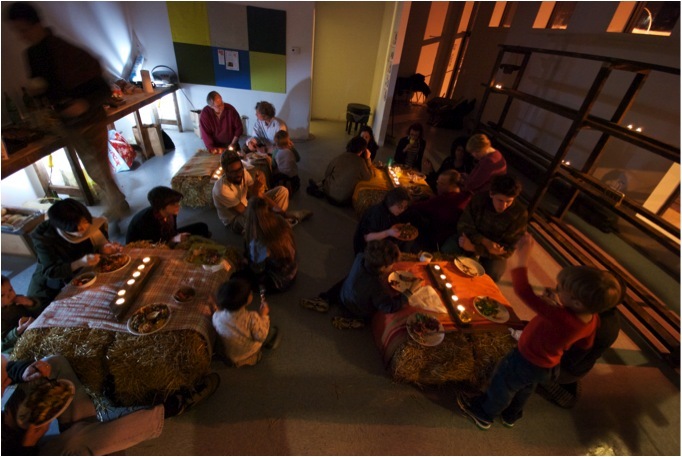 Laura facilitates and organizes programs throughout the year that explore ideas of cooperativism, informal education, social engagement in the arts and co-production. Rebecca Zorach: I wanted to start by asking you not about SHoP, but about the Op Shop, and how that project started and its different iterations. Where did that come from? Laura Shaeffer: The Op Shop started in November, 2009. Before that my husband, Andrew and I had run the Home Gallery for three years and it was very successful in my mind, but it was in our home, and at a certain point our kids were not willing to put up with that anymore. It was like having your house on the market for three years, you always had to keep it up, people came in and you had to make it presentable and live with and care for the the art, there was a lot of care-taking to do. This was probably very good for us, because we’re kind of sloppy, but [chuckles] it was hard. So we decided we would stop doing that for a while, and I had the idea of trying to find a public space for a project that was less about exhibiting art work and more about building community around art, creating this space where art, social life and public life come into contact. I had an idea of creating this kind of hybrid, interactive public arts project, but there weren’t any commercial spaces in Hyde Park that were available to me financially—everything was very expensive. At that time there were many, many empty spaces in Hyde Park. 53rd Street was almost completely empty between Blackstone and Lake Park, and it didn’t seem like anybody was going to do anything about that anytime soon. They were mostly owned by the University and MAC Realty, some held empty for future development and some spaces were just empty because of the economy. I went to MAC and I talked to Peter Cassel about this idea, he seemed interested in it, then we kind of shelved it for a while. And at a later point a friend of mine, Jane Comiskey, wrote me an email and said, “why don’t you try to find a space for the holidays?” She’s an active community member, really supportive of all the projects I’ve done: she was thinking of a sort of “art bazaar” type thing. It was one of those triggering emails that just said, okay, just do it. And coincidentally that day I was walking down the street and ran into Peter Cassel and I stopped and said, “Peter, I think we’re ready for that space now, do you have a space for us?” and he did! So he took us over to 55th Street and it was this big beautiful space under the viaduct, and he said, “how about this space?” and I said, “yeah, this space looks really good.” And then he offered it to us for a dollar and we signed the lease. That’s how the whole thing started. LS: East of the viaduct. Now the space is empty again, actually, but it became PHLI [“fly”], I think it stands for: I Love Hyde Park backwards. That’s what I read somewhere. RZ: But it was PHLI? LS: Yes, after we left it became this kind of lifestyle shop, which I thought was interesting. So we got this space, and I went to SAIC, because they were having open studios at that time, I was trying to, in an ad-hoc fashion, take advantage of everything that was present right now. With the definition of ad-hoc-ism being, using the resources at hand, right now to make something now. I visited the over 200 studios, I went to each studio, and I found, I think, what was about 7 artists to invite to starts the Op Shop. Each one of these artists were doing interactive and collaborative work which in some way required the participation of the audience. And so I started off with these five to seven artists, and the only one that was kind of not doing that kind of work was Vicki Yen, who was an animation artist. And I invited her because her animations were amazing, and I really wanted this kind of mini-cinema to be in there running on a loop every day. She also agreed to do workshops throughout the month, which was important to me, to have the space be used as much as possible, and that’s how it started. 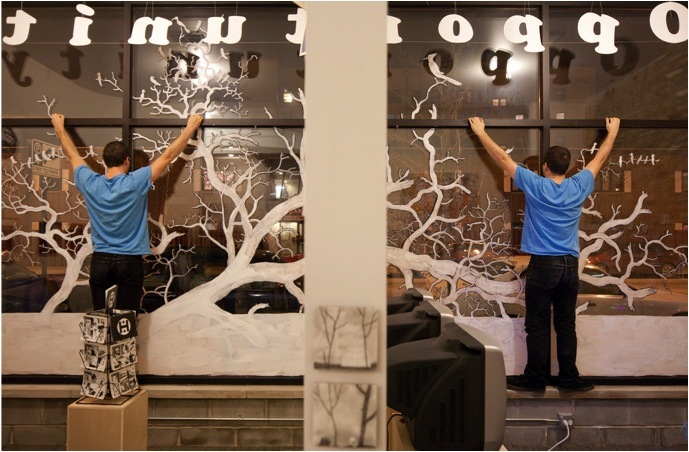 I somehow coerced Anders Nilsen into painting a transparent mural across the windows, he reluctantly agreed, as he was really busy at that time, to do a little something, then he proceeded to paint the swamp trees all across the entire facade of windows, it was amazing. We started out with that layer, and then we invited other artists from the community to bring in their work. We had a little thrift store in the back to help the church, who had actually offered to help us by providing insurance, which we needed. LS: That was the United Church of Hyde Park. We couldn’t do this without a vendor’s license and insurance. The vendor’s license was actually very easy to obtain, I just went downtown and spent a few hours describing what the project is and was, and got a license to sell things, so I could actually pay the taxes and all of that. It was a temporary, itinerant business license. Which is kind of interesting, you know, that you can get one of those, you just have to pay 75 dollars, and then you have this license to sell things. So, with the help of the church we were able to get this million dollar insurance, which was required by MAC Realty, We set up this space, and it was actually very magical, because before it had been empty and it was dreary and covered up with paper and people walked by it everyday, it had been empty for a while. And then it was completely transformed within one week’s time, to this really beautiful art space, with swamp trees painted over the floor-to-ceiling glass windows, all the way across, by Anders Nilsen. It was very exciting to walk by this space that was totally transformed within a really short period of time, on a shoestring budget. RZ: I’m curious about whether this whole idea of the pop-up gallery existed already—were you aware of it when you started? LS: The pop-up galleries downtown were starting, if not simultaneously, then slightly thereafter. I didn’t have any idea about it until months and months after we started the first Op Shop. And then somebody said “oh, it’s kind of like the Pop-up Loop thing” So I have a feeling that it was Zeitgeist, people were having similar ideas about space use and were not necessarily aware of each other, having these ideas in different areas of town at the same time. But the pop-up galleries were quite different in mission. It was pretty amazing, the amount of press and interest we got in that first Op Shop was just overwhelming. I was floating on my intuition and just going along with a perceived need. I felt that our neighborhood needed an independent art space, a space that was independent of institutions. And I felt that I as an artist, I needed that in my community and in my neighborhood there were no small artist run galleries. There were no experimental spaces, there were no spaces where people didn’t have to be vetted and have to come from a certain MFA program in order to get a show. That’s why I started Home Gallery, because I wanted to see people’s work that I couldn’t see in other galleries, and I wanted to give people a chance to show who might not have a chance for any number of reasons. Anyway, so I was working with in a kind of self-centered way, making something happen that I wanted to see happen in my neighborhood. And that was exciting. At least in the initial phase of Pop-up Loop, they used storefronts, windows primarily, to display people’s art, kind of like dioramic spaces, and people could enjoy them passing by, it was certainly nicer to see some kind of interesting art project than an empty storefront. But at that time, you couldn’t enter them. The difference was that The Op Shop depended on you entering. RZ: Yeah, and that’s kind of like Art Here, Art Now too. LS: Right, exactly and ironically, the second Op Shop, I think, was the real prompt for that to happen. So we had our first successful run on 55th Street, and then we needed a few months to recuperate from that. RZ: Did you know right away on the closing of the first Op Shop that you were going to do a second Op Shop? LS: Actually, I think I imagined that it would be interesting to create a whole series of roaming and nomadic projects. But I didn’t get that far in my planning, I was just really in the right now, and didn’t really know what was going to become of this project. And, I didn’t, in that kind of conceptual phase, realize how nice it would be to create a nomadic project. I mean, there were different things that interested me about moving. When I first moved to Hyde Park, I didn’t know anyone, I was very isolated, had two little babies, and had no art community. This was the first time in my life that I actually had no art community. I didn’t know if there were any artists living in the neighborhood, I had been living in Chicago for years but my last real artistic experience in running a project space was with Can Gallery, the Gallery my husband Andrew and I opened up when I came back from Berlin. I lived in Europe for thirteen years, ten of which I spent in Berlin, which was very vital and dynamic and then I moved back to Chicago and had a hard time finding that community here. So we opened this small gallery—actually, it was a really big gallery—in Wicker Park, called Can Gallery, it was a 2000 sq ft storefront, above The Ark thrift store. I think that’s where my fascination with the kind of collaborative element of the thrift and the artspace began. I went down to the thrift every day to get different things for shows and for our dinners and all kinds of things, so there was a real relationship between the thrift store and our house, and our projects. We were there for a year. RZ: What year was that? LS: It started in 2000 and ended in 2001 because our last artist, Dag, from Germany, left directly after the September 11th attacks occurred. September 11 was the last show. It was a big alternative space, a beautiful space. We had some interesting shows, but we didn’t know what we were doing. We were open to anybody coming in, and we got some really interesting artists, we showed Conrad Freiburg’s first stuff little kinetic sculptures and drawings, right out of school, which was really fun. And I really enjoyed a lot of the artists that came in through that. But, it was one of those things where you’d have an opening, you’d have 250 people in your space, they’d all be smoking and drinking, nobody would be looking at the art, and then they would leave at four o’clock in the morning. So, [laughs] at a certain point that became a little irksome and started to wear on me, and also I was pregnant, so you know, that was just inevitable that that had to end. Also we rented from a slumlord and we had rats in our building, and lived above a nail salon with no ventilation, it was just not working out. So we had to stop that project and then I devoted the next few years to having two babies and raising them a little bit. And yeah, obviously that was the main priority and focus for years after that. Then, when we came to Hyde Park, there was that kind of sense of starting over again. RZ: And looking for community? LS: And looking for community. All of the projects I’ve done in Chicago have been motivated by personal needs to relate to the neighborhood and community in which I live, to create projects that have the potential to improve the quality of our lives on a daily basis. For each other, not just for me, obviously. So, I started the Home Gallery with that intent, to find out who is out there. RZ: I remember, I got onto your mailing list somehow, I don’t even know how, but I started getting messages from the Home Gallery and I never came! LS: A lot of people never came! LS: Right, I can imagine that! RZ: But I was always intrigued by it. LS: Mm-hm. I think a lot of people actually were interested but just never made it out. And that’s just the way it is. And then we had a lot of people who came to every single show. We always had a good turnout, it was always very warm and positive. It was a totally different experience, having an exhibition in a home versus in a gallery, people were so respectful and there was a real interest in the art. Everyone looked with a lot of delicate attention, I felt, to the work, the artist was always present and we had a brunch at the end when the artist would come back and often do a talk in the living room. So there was much more of a sense of intimacy with the work and engagement with the work and with the artist themselves. So, that was a really positive experience. LS: The second Op Shop, so no, I didn’t really know that it was going to continue, but we got a lot of good press and a lot of good feedback for the first Op Shop, from people around in Chicago, and from our immediate neighborhood. And so we decided to start looking for the second space. We looked around at a lot of different places but it seemed that the Hollywood Video store was going to work out the best. We looked with MAC Realty again, but the places were too raw, they didn’t have bathrooms or they didn’t have adequate heat or something of that nature. The Hollywood Video store was owned by the University, which was a whole new body of people to communicate with and brought in a whole new element of bureaucracy that I wasn’t used to. There were many, many people to talk to and a lot of negotiation in dealing with the University of Chicago, versus MAC Realty. Peter Cassel was very direct and straightforward, it just happened, immediately. Whereas this process was working with an institution, so there were a lot of people to check with and to talk to and a lot of negotiation. It took quite a lot of time and a lot of effort and a lot of letters, and back and forth, until we finally agreed upon a rent, which, in this case it was much more than a dollar. [laughs] It went from 50 cents to 2000 dollars, to 500 dollars, and in between were letters. Letters, back and forth, “well, we can’t do this” “no, that’s not quite what we’re able to do or philosophically what we even want to do” [chuckles] And so we finally negotiated the five hundred, we thought we could handle that if we had a thrift store. Which was based on the first Op Shop’s successful church thrift bringing in close to a thousand dollars in one month, this gave us an idea of a budget. The second Op Shop was an exploration of a lot of different ideas that came out from the first Op Shop. Needs of the community, more project-based and more performance-based installations, and then the potlucks started in the second iteration. We had about 7000 sq ft, and it was really a mess when we came in. There was a lot of mold and no ventilation, we had to do a lot of physical cleaning and work and taking down of big walls that were covering all the windows where the adult video area or the gaming area was located in the Hollywood Video. The basement was intriguing and exciting but also hazardous in some ways. [laughs] So we had to work in a different way for this next one, but it was really in retrospect, one of the more poetic and romantic Op Shops, because we had to transform the space so much, we had to work so hard to make it what it was, we took down walls, scraped off white paint on all the windows and opened it up again after a very long time of vacancy. The former Hollywood Video had an interesting deeper history in Hyde Park. There were tenement houses at that corner which were torn down to put up this new Walgreens. People remember going to the soda fountain there and having their first soda together when they were kids. Then it became the Hyde Park Federal Savings and Loan, and that held a lot of memory for people—where they got their first mortgage for their house—and then it became a bookstore. I had this in my mind for a while and now I’ve forgotten the name of the bookstore. It was all written down. So it was a bookstore for a long time, and then it became a Hollywood Video store. RZ: Was it Kroch’s and Brentano’s? LS: Yes! Kroch’s and Brentano’s. I think that was a really successful business, then they tried to open up a bigger business downtown, they tried to get too big maybe too fast and it I guess it just didn’t work out. I’m sure there’s a lot of complicated details with that. And it went out of business and Hollywood Video took it over. Then Hollywood Video moved in for a few years then left, I think it had been empty for years before we moved in. It’s amazing how little time it takes for a space that’s neglected and shut down without ventilation, heat or air conditioning and people to take care of it, to fall apart, to become decrepit. It’s just amazing how fast neglect works on space and on architecture. So, it could have been a year or two or three, but regardless that place was uninhabitable. And we were in it for two months, but it probably took a toll on our health, I mean, there was a lot of mold and a lot of issues to deal with. Obviously it was habitable, but it was really falling apart. And now it’s gone of course. RZ: I can’t believe the University wanted 2000 dollars a month for it! LS: Well, at first it was kind of ironic, I met a wonderful person from the University, Jim Hennessy, and he seemed really interested, personally, in the project, and was very supportive. he took us around to several places that were empty in Harper Court, and kind of enjoyed the whole idea of using these spaces with us, and saying things like “oh, MAC Realty gave it to you for a dollar? Well we’ll do better than that, we’ll give it to you for fifty cents!” so it was all really exciting. And then weeks went by, and I think in those weeks, one person’s support and excitement had to be shared with a board or a group of people in charge of University owned property, and so it had to go through all of these people, most of whom were probably thinking about liability and thinking about setting a precedent for the future will other people now bother us about using our vacant spaces, etc. So they began to withdraw their offer. So we talked it over and I wrote several very calm letters about why I thought they should support this, it’s good for them on many levels and good for the community and just a good thing. And we’ll have insurance for a million dollars and we’ll have a vendor’s license and it’s all legal and all this stuff. So finally we settled on the amount that covered the costs incurred by the University, like heating costs. it took a while to get all of this worked out, but eventually they decided that a 500 dollar contribution to the heating bills would be adequate. [laughs] And so we settled on that, and we paid it. 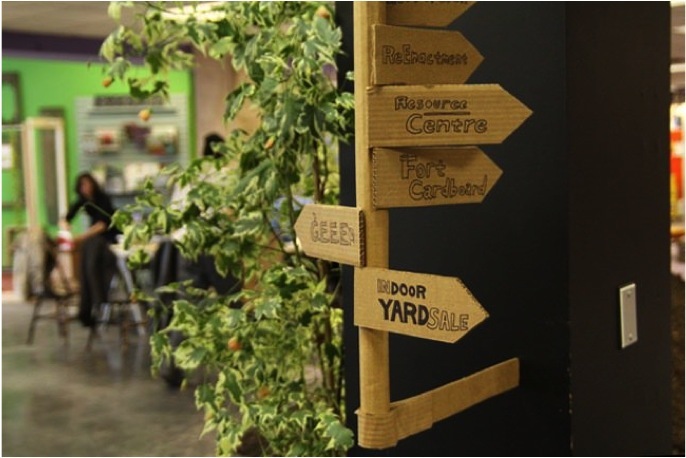 we had lots of different projects that explored alternative economy, trading, thrifting, swapping. We had a garden exchange project, a thrift, and we started a time bank. That was just the very beginning of the time bank, which two years later we realized takes a lot of time to develop and a lot of effort, a lot of research, and a lot of convincing people to get involved in something like this. So there were a lot of alternative economy projects: trading, thrifting, swapping. RZ: Would you say that it was less art-focused in that incarnation than the first one? LS: Yes. It was art-focused in a more “socially engaged,” “relational aesthetics” sort of way. We had oral history projects, we had a mini-Creative Re-use that we tried to get going there. We invited the high school students to create a mural inside of the video store. The title of the show was Ad-Hoc-City we had this idea that we would create an entire village of small ad-hoc projects. And the concept didn’t quite pan out, which is no surprise, no concepts ever do exactly in these kinds of things, because it’s not like you have months and months of planning and an artist’s call out and months of curating time, it has to be very quick and everything’s pretty, well, ad-hoc. The idea was that we were trying to get people to come in and set up certain kinds of shops: alternative businesses, alternative economy projects, ways of exchanging information, knowledge and skills. So we wanted an info shop, we wanted an oral history project, which Paul Durica actually did do there. In the basement we had a lot of really interesting performances, and we had concerts, dance performances and we began our potluck dinners on Sunday nights. It was a really big space with a lot of challenges, physical challenges, and one of the main challenges was staffing, getting people to actually volunteer their time to be there. Which is always a problem in these kinds of non-funded or privately funded projects. 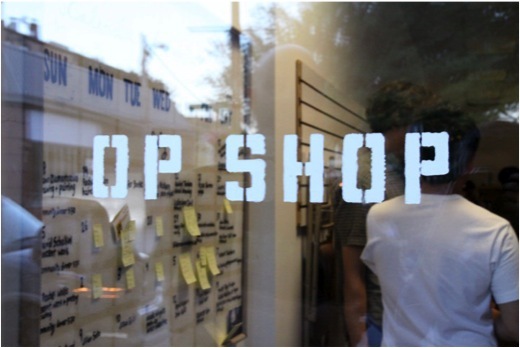 With every Op Shop there’s the hypothesis or the idea that you want to work with, and then there’s the result, the reality of what happens, and then there’s the phase where we reflect and learn from what happened which leads to and informs the next Op Shop. So in this case there was an enormous amount of learning that happened in two months. About our community, about ourselves, about the alternative currency projects that we started. what worked and what didn’t. Then we had one month to prepare for the next space, the former Dr. Wax in Harper Court. And we decided not to really make it into a visual arts space, or a project space necessarily at all, but we decided to tackle the problems of the last two Op Shops in this third project—and by problems, I mean, challenges to a project like this, how to confront these challenges creatively so they become a project in themselves. Staffing was an issue: I was exhausted, because I couldn’t go in there every day anymore, I had kids and it was summertime. The other issue was audience. We had lots of wonderful performances but we didn’t have enough of an audience for them. So I decided I would try to think about all of these things creatively and set up an installation that dealt specifically with those two issues. Increase and diversify audiences and get people to staff it, every day—everybody else but me! So we took this long corridor of a space and put up slat boards on one side and built tables that were foldable with horses I reached out to the community to borrow a series of folding chairs, up to 32 or 40 folding chairs, and went around everywhere collecting folding chairs from places, a “curated” selection and put up little hooks upon which to hang them. it was all kind of Shaker style, we could fold the folding chairs up, put them up on the slatted boards which ran the whole left side of the building, fold up the twenty feet of table and the space became very versatile, a completely flexible space. And I called the project 30 Days, 30 People, which is probably one of the worst titles I’ve ever heard in my life. Just, terrible! But I couldn’t think of anything else, it just was what it is. It is what it was. Like Home Gallery. Sometimes your mind just goes straight to what it is and it’s fine. And so we had thirty days and I invited 30 people to take one day out of the month to do whatever they wanted. They could do a performance, they could have dinner, they could build a chicken coop or just sit there and read. And it could be as elaborate as they wanted, they could build a whole stage and have a theater production in one day. Or they could, you know, just show their recent paintings, or use it as a studio space. There were all kinds of possibilities, and I gave a bunch of ideas in my call-out and then I said, “but you’ll come up with yours, whatever you want to do is fine.” You put down your name on the calendar and you got the keys. RZ: Was it first come, first served? LS: First come, first served. We had a big physical calendar we used post-it notes, and that’s how people began to schedule themselves. So that’s another element that I haven’t even talked about, we always asked the community to come in with ideas and enter them on this huge calendar, I miss that calendar. For example, if you are working with prisoners and you’re doing zines with them and you want to have a demonstration of this, or make prison food, you just scheduled yourself. Those were just two interesting ones that came up. Things that I couldn’t even imagine happening in the community, started happening. And people come in and they say, “well, I want to talk about this” or “I want to show this performance.” And they would just write on a sticky note their information, I would get back to them, and put them on the schedule. This was before we had a website and schedule and all that stuff too. So that calendar system came into the third one and was presented at the opening. We had one piece of art, one visual piece of art that opened the show, and it was by Todd Baxter, one of the series called the Owl Scouts, a series of incredibly beautiful big photo montages by Todd Baxter. It’s about these Owl Scouts, these two children who get lost in the woods. They get separated from their troop, and the image that we used is the little boy reaching into a burrow for his flashlight that fell down into this hole. And right next to the flashlight is this owl. And it’s kind of a slice into the earth where you can see all of that and the hand reaching down. And there was just something about that search, something about that seemed kind of emblematic or representative of the process. So we had that one piece and that was it. It was really minimal and really beautiful and we opened up with a performance night and after that opening people began to schedule themselves for each day. And it filled up really quickly—we had thirty people and we had thirty days, and I practically didn’t have to go in at all. I had a set of keys, they would pick up the set of keys, and then afterwards they would deliver the keys back. I went in every day because I was curious, because I wanted to know what was happening and I was excited about it—but I could come in as participant/audience member now. In each of these projects I always had a partner, collaboration was key. In the first one I worked with Amanda Englert, she was my partner and she and I did everything together. The second and third one one I worked with Rachel Tredon, Rachel did most of the photographic documentation, both she and I took a lot of the photos, but she took the really good ones. we both worked on documenting the project and of course conceptualizing and creating it. There was a partnership and a collaboration that was integral to the project. So in the second one we worked on together, neither she nor I really had to be around, but we were. I have the tendency to feel responsible for everything, so that was a big relief, to not have that responsibility, at least to be able to share it with many others. And so that worked out really well, and in terms of the audience participation, the idea was to pair a dinner with a performance, for example if Adam Rose with Antibody Dance was scheduled to perform, we would invite someone from the community to host a potluck dinner that would take place after the performance. On the same evening, so we would ask them to invite up to twenty or thirty people. Those people would then come for dinner, bring food and drinks and become the audience for the performance, after which everybody would sit down together and eat with the artist and whoever the artist would bring. RZ: And how did that work with the 30 days, 30 people? Was there a dinner every night? LS: No, we scheduled certain performances that really needed good audiences, they were mostly at the weekends, we probably had 8-10 of them. the 30 days, 30 people were usually shifts from either 2-6 or 10-2 or 10-4, something like that, during the daytime hours to keep the space open as much as possible. Of course, if somebody required the entire day, then that’s what they would require. And if they required the entire day to work on a performance that would start at 7 p.m., then we could couple them with a dinner. So the dinners were really specifically related to the performances. RZ: Was the 53rd and Ellis one the next one? LS: Yes, the last one before SHoP was at 53rd and Ellis. Unfortunately Rachel, my kind of right-hand woman, had to move on and do her own thing, ’cause it’s completely all consuming. Rachel was thinking about moving to Toronto and has since done that. So that collaboration naturally had to end. what I’ve found is that these are very overwhelming and intense projects, and you need a lot of time to recuperate from them, and often if you have already a relationship that is in itself very intense, that kind of working together on a daily basis, 24 hours a day on a project like this can be really overwhelming. For the relationship as well. everybody needed time away, so we took a long hiatus, between the third Op Shop and the fourth one. And Rachel left, which was a huge loss. the fourth and last one before the current SHoP project was in the spring, so we were in Harper Court in August. RZ: That was August 2010? LS: Mm-hm. And Spring 2011 was the last iteration. Yes, that was on 53rd and Ellis and again, that was in response to spring and the desire to start over, because partnerships were not there and I was alone and I really wanted to continue the project. And it was spring and I was thinking about trying to start this learning garden in a public park—which I still have to work on And I thought, wouldn’t it be amazing if we could take a space that was an empty storefront and turn it into a greenhouse? It would be a symbolic, as well as a real gesture toward growth and we would take all that growth and put it into our garden. I knew of two artists who were working with urban farming projects, and urban agriculture, Amber Ginsburg and Lia Rousset, and I wrote to them and said “I know you’re working in this field and I’ve heard about some of your projects.” One was “Connect the Lots”—that was a project where they had several lots that they were working to acquire from the city, and then they were going to plant these with different plant species. I wrote to them, basically with the same exact sentence that I just said, “Wouldn’t it be great if we could do this? Would you two like to be the resident artists of this project?” and they loved it, and so they said, “yes, let’s do it.” So then the Op Shop had one specific installation, like in the third Op Shop the installation was done by me, the fourth one was done by Amber and Lia, and they built shelves and a whole structure to grow things. I collaborated with them in that I told them what the Op Shop was all about and what we did, so we came together to develop a month of loose programming and ways of creating dining space, because we wanted to keep going on with the Sunday potluck dinners, which were very popular. And we wanted to kind of focus on DIY practices and artists coming in to teach things as well as community members coming in to teach things, informal learning. And a lot about food and a lot about urban farming, we called it urban agriculture. We emphasized the “culture” part of it. We had a lot of projects and artists dealing with and working with urban farming and food. 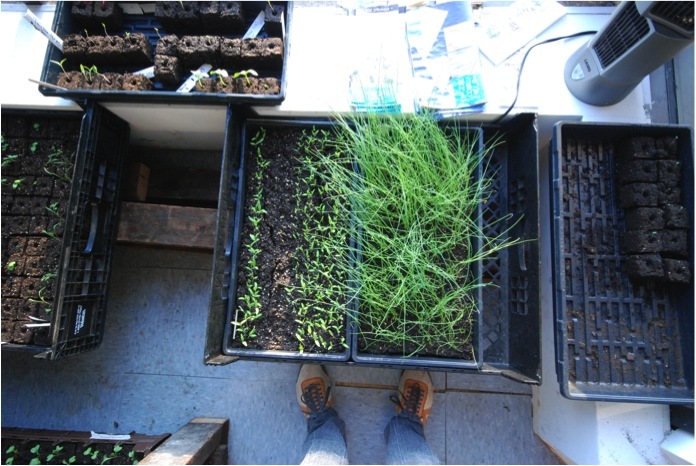 I thought it was kind of exciting to focus on urban agriculture projects in springtime. we had bales of hay for our tables and we wrapped them with blankets, and we had candlelight and it was very romantic and beautiful, and Lia and Amber and I made the little dirt cubes and planted the seeds, We all tended them. And that’s kind of what we did, it was really about growing sprouts for our various projects. But inside of it were all these wonderful concerts and open mics and talks and memory shares and everything that we have going on with the Op Shop. And even some little art shows and salon evenings and things. Chickens were in there. We made yogurt, we made beer. And that was the last one. I was in it alone, I mean I didn’t have a partner in the fourth one. It wasn’t really staffed, because we didn’t do the 30 day, 30 people thing, but we had events and we opened it on an event-based schedule. We had event-based opening hours and care-based opening hours. We did invite sprout-sitters to come and care for them. And we got to know some wonderful people through sprout-sitting! People who came in and said, “I wanna sit the sprouts!” and they did. RZ: Did they talk to them? LS: Oh yeah, in my call-out for sprout sitters I said, “you can sing to them, play music, read poetry aloud to them, or just be in the same vicinity as them” [chuckles] and I think they did! I got lots of stories about how much pleasure people got just watering the plants and watching them grow, hanging out in that humid air of growth. So it wasn’t the 30 day, 30 people big ordeal, it was quiet, but it was definitely sat, it was a sat space. RZ: Who was the landlord that time? LS: That was MAC Realty again. Peter Cassel. That was another super uncomplicated situation. I just went to him and said, “we have this idea, this is what we want to do, do you have any spaces?” He showed us two or three spaces, one of which was absolutely perfect. It was a corner space, had lots of light and big beautiful windows. It was clean, we had to put in some things, like doorknobs and things like that, had to paint and fix it up a little bit, but it was actually really fine. In typical Peter Cassel fashion, I said, “we want to be able to compensate you, because we’re asking for two months for this growth period, and we don’t want to necessarily assume that we can do it again for a dollar, what do you think about the price? What do you think about the dollars?” And he said, “well, how about this, make it in the hundreds, and I’ll accept anything.” And that was so perfect, because we knew not to suggest less than 100 dollars per month, right, because he told us, but we also knew that if we came up with a number that was completely doable for us, it would probably be accepted, because he said it would. So that gave us a lot of freedom and also a guideline. We came up with 300, because we were three people, and each person could pay 100. We offered 300, and he gave us the two months for that amount. Eminently doable. But then with every Op Shop there’s just a ton of costs that one incurs, from the vendor’s license to, to materials and food etc. Actually, we were covered by Open Source for the fourth one, for insurance. The insurance is always the problem, for the first and second one we were covered by was the church, then HyPa, covered our insurance for the second half of the second one. RZ: So in the transition from the Op Shop to SHoP, was getting a big space like this something that you had always had in the back of your mind, or was it really an opportunity that presented itself to you and you took it? LS: After the fourth Op Shop, I started feeling that one really interesting part of the project was the fact that we moved. We got to know different people on each street. We localized, just like everybody localizes. You really get to know your block or your five-block radius, with a project like this. I found it really intriguing that I no longer saw the same people that I saw on 55th Street, when we opened on 53rd street, but every once in a while if I would go over there to a restaurant and I might see that whole crowd, or one of two of those people and we greeted each other as neighbors. So I really liked the nomadic quality, I really liked moving, but there was an exhaustion factor, we always had to find storage for all of our stuff, or we had to get rid of everything and reinvent ourselves each time, physically with stuff. That was a major cost in the project too, our tables, chairs, all of the things that we needed new each time. I decided at that point that maybe it would be good to have a longer term lease. If you can do this in a month or two, what can you do in a year? I started to think about finding a place for one year, that was dreaming in many ways, and I still wanted to continue to be a roving project, for many reasons. It was April, and we really started focusing on other projects like the learning garden I was looking into different spaces, for fall, I was thinking about the Del Prado, it was a big huge 4000 sq ft open space and I had some ideas about inspired by this movement in the 40s called the Adventure Playground, or the Junkyard Playground. I had been reading a lot about the Junkyard Playground movement, which was started by an architect in Denmark in response to the lack of play spaces for children after the war. Since I have children myself, I’m always thinking about public play spaces where they can go and the evolution of play structures due to liability issues and fear, how our play spaces have had to change throughout the years. So, I was totally intrigued by the adventure playground idea which was the result of watching the natural way kids used materials at hand, building rudimentary infrastructures from rubble. The children were invited to interact with the basic structure built mostly by adults and to continue to build and paint and create the play scape themselves.These adventure playgrounds were all over, they’re still in existence in Europe. They also came to America, in California and various other places. Slowly in the 60s and 70s I think they enjoyed a certain popularity, and around the late 70s, 80s they started to be shut down. Mostly because of, well, two reasons, liability issues and the cost of maintenance and staffing. Because they did cost money, they were actually staffed parks. The staff was in charge of safety and facilitating play with the children. So funding was an issue and then liability was an issue, although there’s almost nothing in my research that proved there were more injuries in these parks than there were in any other park structure. I think there were actually more reported in regular park structures. I was really interested in this whole thing, and also just the artistic quality of these spaces. I then invited my friend John Preus, a builder and a craftsman and a wonderful conceptual artist, to join me in creating the 5th Op Shop about the junkyard playground. I wanted to work with an environment that was being continually built and rebuilt by artists and children. And I wanted to work with some things that no longer exists in the public school system, something that seems to be really significant to me is the elimination of the woodshop. All of these learning-by-doing physical trades that we used to have in schools are gone, home economics, leather work, sewing, woodworking, cursive writing, art, music, play…what’s left Learning how to make things and learning how to do stuff just isn’t a part of our public educational system anymore. I thought we could combine having a woodshop, invite artists who build to create a kind of little village in this 4000 sq feet, kind of like a town hall space, you know, and then in the center of all of it would be this adventure playground, that we would be building together over the two-month period of time. RZ: This is the old Hyde Park Art Center space, right? And I said, “I have some ideas!” so I went over there and I said, these are the ideas that John and I had for the fifth Op Shop. 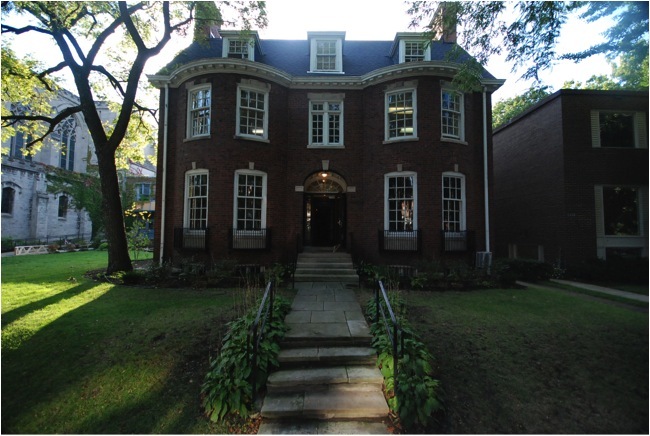 We described our ideas for the Del Prado and tried to imagine working with the same ideas, not in the same way of course, because it’s not that same space, but we could adapt the ideas and the concepts into kind of a Hull House like- local cultural center. We’d like to have a woodshop, possibly a recording studio, or some kind of radio program going. We’d like to have making spaces, maybe even a small thrift, to help to support the project, we definitely want to have artists in residence and studio spaces, so basically it was a combination of a studio spaces, production spaces, exhibition space most of the house would be would be open to the public, to make things together. And then on top of it we would have our potluck dinners, and we would have our events and everything else we do. And she seemed excited about it and everyone was really excited. When we visited the house, we saw that there were challenges to our ideas, how can you set up a woodshop in this old basement? How do we get all the wood down there? We had issues to deal with. But it was all eminently doable. It was really something that presented itself as a real option at that time in September, the idea was that we would have a year to develop this project and would ask the church to rent it to us at a below market fee to incubate these ideas. We started the process of presentation and developing ideas. At that time we got in touch with a couple of other people who were interested in collaborating and found Gabriel Piemonte who was interested in the recording studio, Theodore Richards from the Chicago Wisdom Project, working creatively with youth. So we started in September and we had presentation upon presentation and we had powerpoints and we talked to the congregation and to the board and to everyone else. It would take a year before we signed a lease. It was complicated, the church owned this place since the 50s and they were used to getting a certain amount of rent from Blue Gargoyle and the Booth Business School, when that situation ended three years ago they had a deficit. Many members of the church were really excited about keeping their asset, and using the space creatively, but many were staunchly against it. So you can imagine what that period was like, debating such a complex issue in a congregation of Unitarian people who are very careful and conscientious individuals. RZ: And like to talk. LS: Yes, and they like to talk, and like very much to be very considerate of everything and everyone. so it took a year! They finally voted to allow us a year to incubate this project, and we were to pay the overhead of 1,500 dollars a month, and then we were to develop a 501(c)3. And that’s how that all came about. I’m sure I’m missing the more interesting aspects and just focusing on the practical side. RZ: So, rather than asking you to talk all about what SHoP has done so far this year, and what it’s going to do, ’cause its still such a work in progress, maybe it doesn’t make sense to kind of reflect on it yet? But I do want to ask you about something that I think maybe has been an issue for Op Shop and now for SHoP too, which is about the relationship between the “art-world, art scene” art and the community side of things. Especially given what you pointed to, the trendiness of social practice or relational aesthetics. How do you sort of navigate the sincerity of the community aspect in relation to art-world expectations and trendiness? LS: That’s a really good question, and it’s definitely something that’s been present from the very beginning of all of these projects. There’s a context that is expected and there’s a kind of trajectory that is followed and expected in the art-world…and so the mix of of things, the hybrid space, can be a little bit uncomfortable for some people. To mix the every day human needs, the civic and social needs of a community, with an art space, and contemporary art practices, seems to make people nervous and uncomfortable. And that is exactly what is interesting, for me, but it isn’t for everyone. Some artists might come into a project space like this and think, this is not going to get me where I need to go. Which is fine, there is that more conventional and conservative aspect to the art world and people might, if they’re cultivating and creating a kind of linear narrative for themselves as artists, be very careful about context, where they show, with whom they show, and how and where their work is seen. And I totally understand that. We have had some of the most interesting contemporary artists working with us, but those artists are actually intrigued by and interested in that kind of edge. And walking that edge, their projects, many times, are about that interaction, that meeting and overlapping and the balance between order and potential chaos that can ensue in this kind of space. They’re interested in the built environment and in relational aesthetics. I think it really ends up being a project about Public Artists who act, think, and/or learns publicly, and in some way exhibit his/her performance of daily life, or entangles it with public life. Or it’s just people who have the feeling that they want their art to be seen, and they love the warmth of the lived space. Because galleries have only one function, a white background for the presentation of art. Which is great but it’s not that kind of everyday lived in space of the home. So, you know, some people really feel comfortable showing their work in this semi domestic context. But it’s always present, that tension. I’m sure all of us working in this space as curators, artists, educators, cooks, film makers, woodworkers, artisans, writers…all of us working in the space to do anything have to be somewhat always aware of this order and chaos at the same time. There’s got to be a certain balance between those two, you can’t tip too far into one or the other without losing that edge space, that kind of in between that’s neither one thing nor the other. RZ: So is art order and community chaos, or the other way around? LS: Um…absolutely both in many ways. When you really think about it there’s a lot of art that can be chaos and create chaos, and there is a lot of community-orientation that is almost overwhelmingly ordered, and in order to keep the kind of vibrancy or the vitality of the project alive, you have to embrace the virtues and values of order and chaos of both the art-world and the community! RZ: I’ve been thinking a lot about why is it that artists create community spaces, and not just because it’s a trendy art-world thing right now. But one of the things that art and community seem to have in common is this kind of relationship to order and chaos, that there’s this impulse to bring order out of chaos or to turn order into chaos, I don’t know! So that was a really interesting way that you put it, that that relationship between order and chaos is also very much about the relationship between art and community, even if it’s not that one is always on one side and the other is always on the other. LS: Right, right. It reminds me, and it’s interesting that we’re talking about art and community in relation to the institution of art or formal education. What we do is informal, informal teaching, informal learning, and we also do a lot of informal exhibitions, but there’s a thoughtfulness behind all of it, and that has to be there. When you look around this space, there are a lot of remnants of art projects, but they’re pretty sparsely and minimally handled and cared for. And that’s really the only way that you can combine all of these things—if there’s a kind of attention to detail in each element. So the reason why the thrift store, for example, has become completely out of control was because there was no longer that ability to find a form for it. This seems like a constant struggle between content and form, how to give form to content and how to keep content alive in form. And so it’s just this constant work in progress. And I feel like the community is as rebellious, in many ways, as the artists are, to this kind of overarching order that’s imposed on you. So in a way, the artists and the community are trying to develop their own sense of order in a chaotic world. And the desire to break down the order is kind of that spirit of wanting to rebuild. It’s like the child’s instinct to build something up. As soon as you build something up with blocks and you have this amazing structure, there is an overwhelming urge to just tear it down and destroy it and watch it all fall apart, to build it back up again. So maybe that’s just our work, as artists and as members of the community, this is what we do. It’s kind of our way of dealing with life.